Watch and record 16 programs at once and say goodbye to tuner conflicts. Channel surf and access any of your favorite content at lightning speed. Meet the new Voice Remote. It's the latest technology from DISH that's aimed at improving how you enjoy your favorite programming. Surf the channels or search for your favorite programming all by simply speaking to the new Voice Remote. This remote features advanced voice recognition technology to complete your commands. Simply press and hold the button to enable voice recognition and speak the commands for an easier TV experience. When you want to take matters into your own hands, the Voice Remote delivers. At the center of the remote is a clickable touchpad that allows for smooth navigation. This touchpad responds to swipe and scroll gestures for more intuitive commands. The rest of the remote features large, easy-to-see buttons that improve ease of use. Its simplified design sports chrome highlights and red striping while offering a total of 19 buttons on the top and 7 on the sides. Internet connection is required to use voice feature. Watch all your recorded programs on the go! Change the way the entire family catches up on great TV - anytime, anywhere and without a data plan. Available for just $99 with no monthly fees. The new HopperGO provides over 100 hours of storage space for all your DVR recordings. Simply transfer your movies and shows to the HopperGO, then connect your mobile device to its private wireless network. 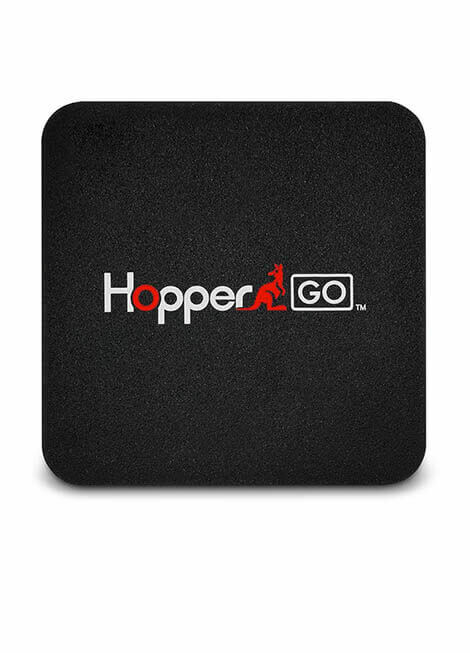 The HopperGO instantly streams your entertainment collection to up to 5 mobile devices at the same time - no Internet connection or dipping into your phone's storage capacity required. To order a HopperGO, you must first have a DISH Hopper TV Receiver installed at your house. Then simply call to purchase your HopperGO. *Internet-connected Hopper 3 or Hopper 2 required. Save up to 2,000 hours of your favorite shows and movies on 2 TB Hard Drive. Say goodbye to unsightly cables and say hello to the Wireless Joey.